Win a Friends Prize Pack! / It's Just Movies Win a “Friends” Prize Pack! Win a Friends Prize Pack! Not many shows take pop culture by storm like “Friends” did almost immediately, and far fewer maintain such a large presence for 10 years. “Friends” was the first show I ever bought on DVD and I have certainly got my money’s worth. It’s expected now that all TV shows will go on DVD and Blu-ray pretty soon after they air (usually within a year), but that wasn’t always the case. It was phenomenal to have every episode of “Friends” available at your fingertips. The only way to make owing “Friends” better would be to have it on Blu-ray and now you can! “Friends: The Complete Series ” was released on Blu-ray today and to celebrate, Warner Bros. has given us a prize pack to give away. 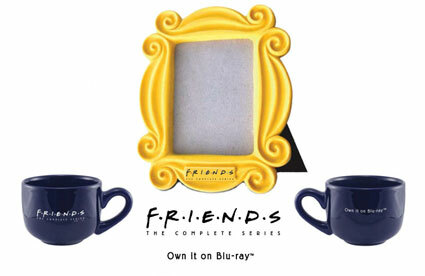 This Limited Edition “Friends” prize pack includes two over-sized cappuccino mugs and a picture frame just like the one on Monica’s door (see the prize pack below). To win, all you need to do is take the “Which Friend Are You Most Like” quiz in the app below and post your results in the comments section of this story. Please note: The winner must reside in the United States of America. The contest will end Nov. 27 at 4 p.m. EST and 1 p.m. PST. When you leave a comment, it will ask you for your e-mail address. Please make sure to use your real e-mail address so we can contact if you win. Your e-mail will not be used for any other purposes. In the meantime, check out a new clip every week in the app below and pick up your copy of “Friends: The Complete Series ” on Blu-ray today! I got Rachel! Yay me! Strangely, I got Joey. What does that say about me? I do love two pizzas, though. I am a Monica, with Rachel as second place. But I already figured I was a Monica. Monica! Well, I do love to clean. I got Joey. Of course. Rachel! I look just like Jennifer Aniston (as far as you know). I got Joey. Of course I got Joey.